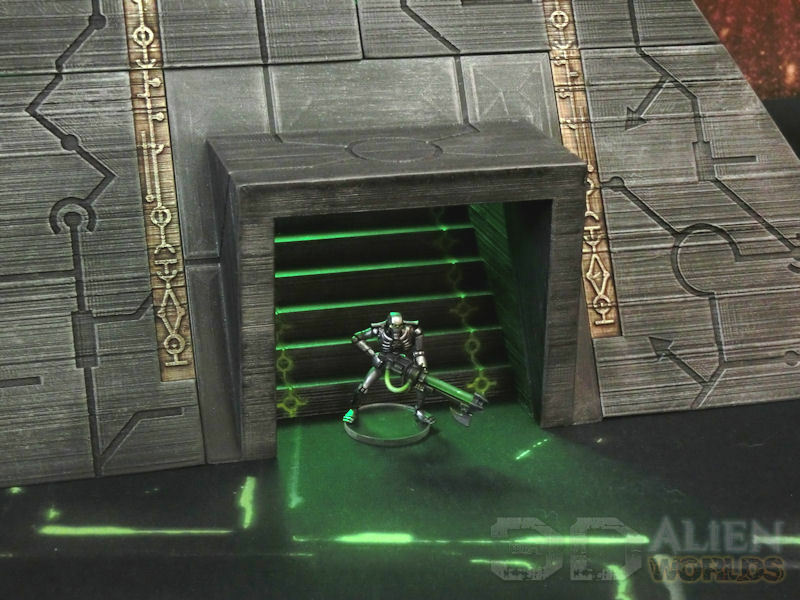 This is a project I wanted to try for quite a while now, and over the past year I've been slowly designing 3D models to print for a Necron-themed gaming board - my printer arrived last week and since then it's been working overtime on all this massive terrain! 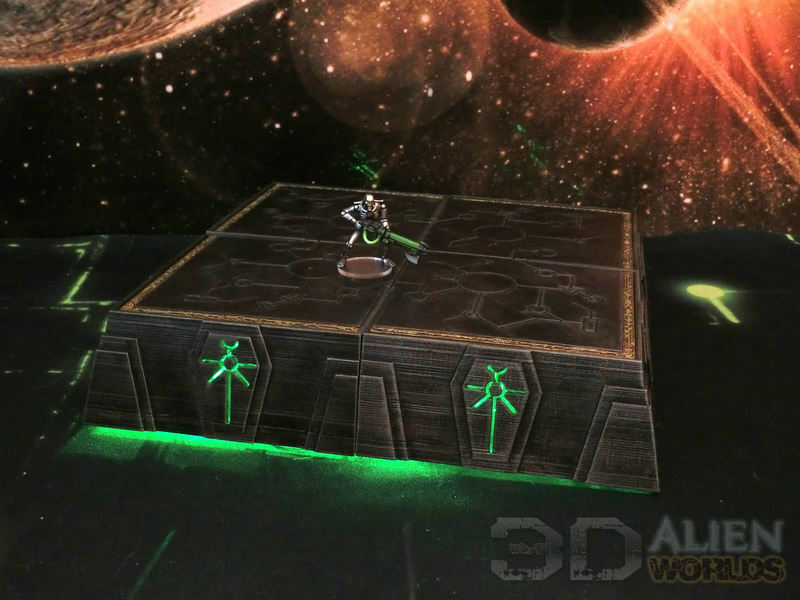 So here is a progress blog of Necron terrain as it comes off the printer. 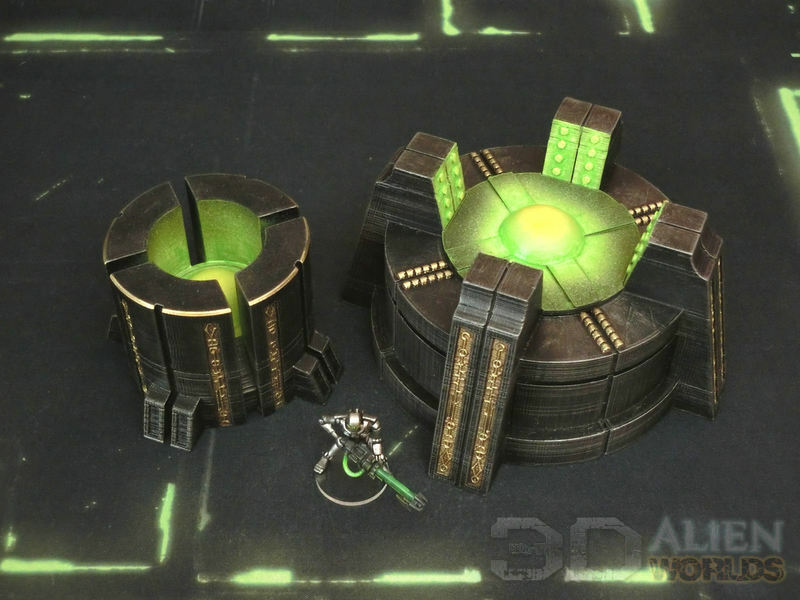 For those interested, I've created a site to sell the 3D print files (very cheaply), so you can print your own. 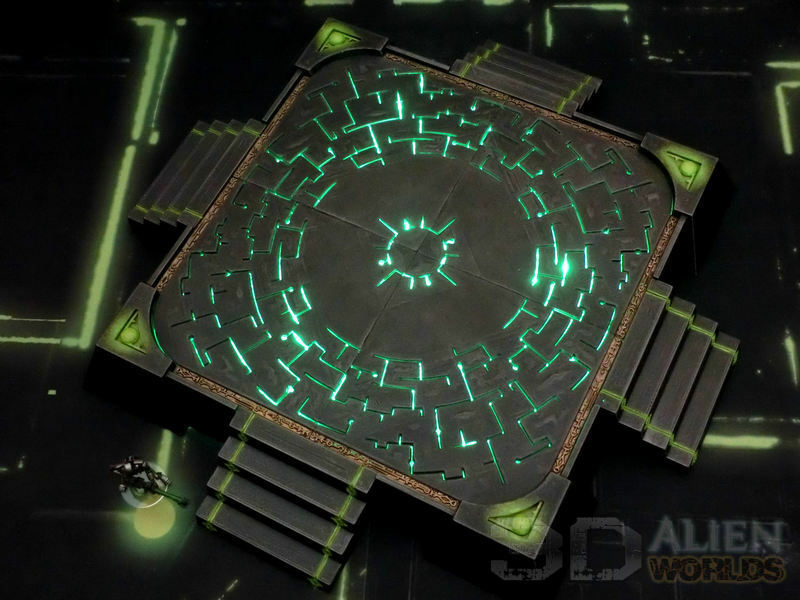 ▲ This is the first of the terrain pieces - a fairly huge landing pad. 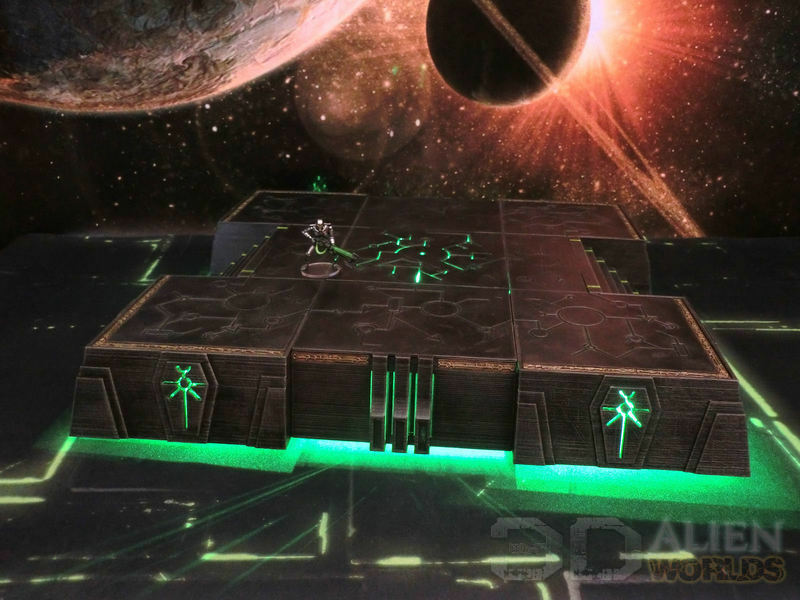 The inside is hollow, allowing fanatics to place LEDs underneath and light up their tables! 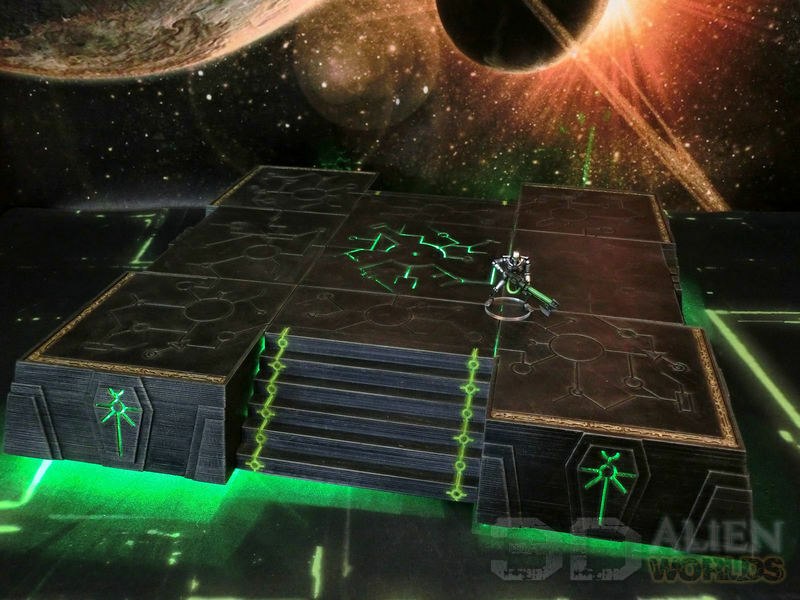 ▲ I painted it up in classic black and green colours, to match our Necron gaming mat. Simple, but effective! ▲ The view from above is pretty darn cool! ▲ Ned the Necron is a happy chappie! Just look at that smile! 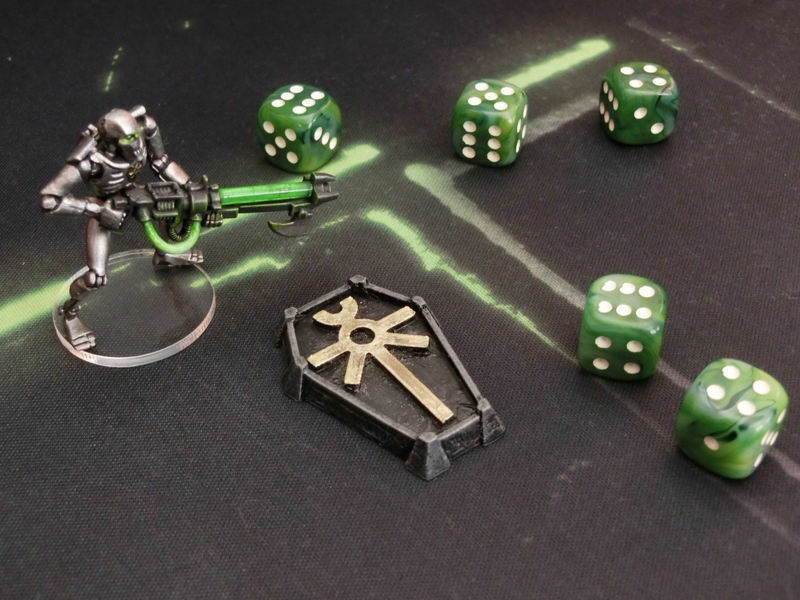 ▲ I thought these would make for fun and simple counters, for command points and so on. 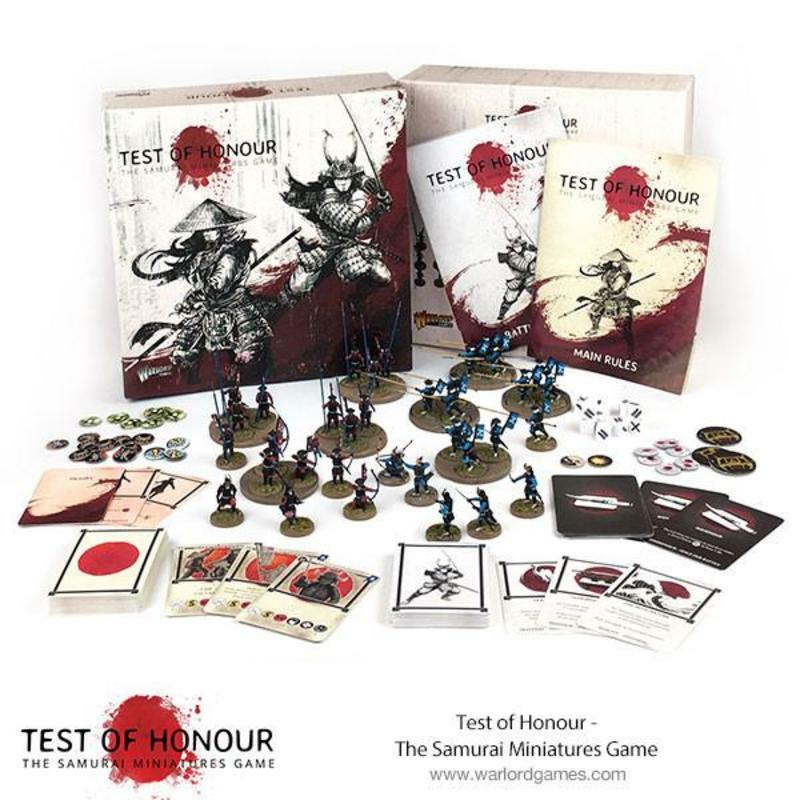 Or even objective markers? 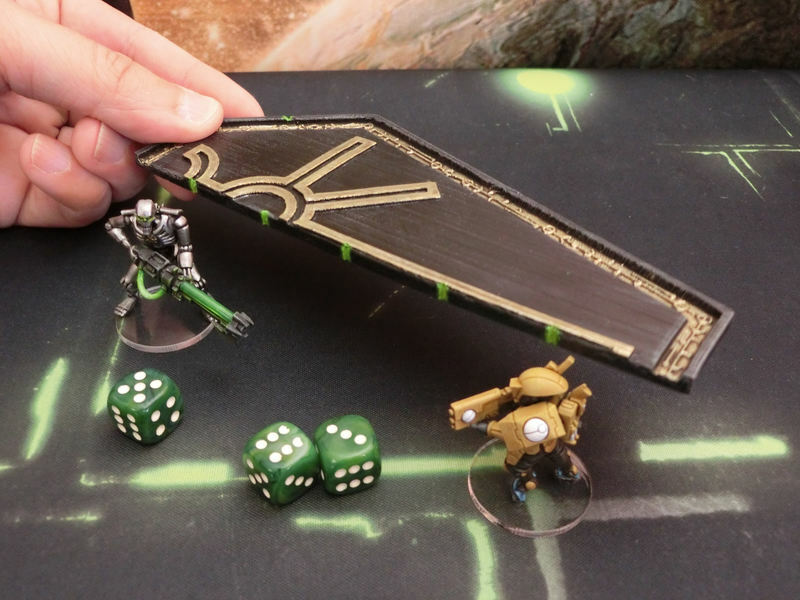 ▲ Just a simple 6" ruler, for moving models around the board to crush and destroy those upstart races! This was basically a test print, so see whether the 3D printer could accurately print the symbols I wanted to include on all my terrain. It worked, so now my printer is working overtime trying to crank out some huge pyramids!! 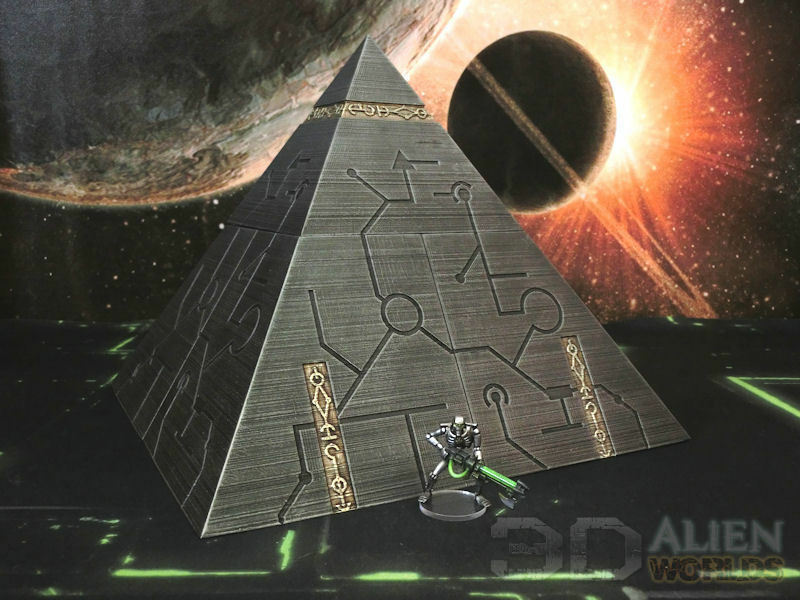 ▲ The biggest terrain piece for the Necron board is this massive 3 level pyramid. 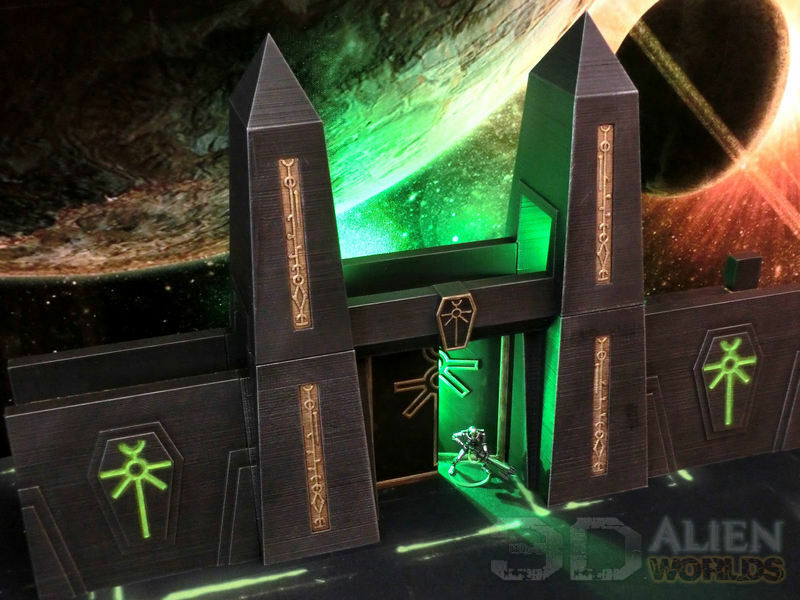 The sections are modular, so this version has the cut-out doorway with an LED behind it. 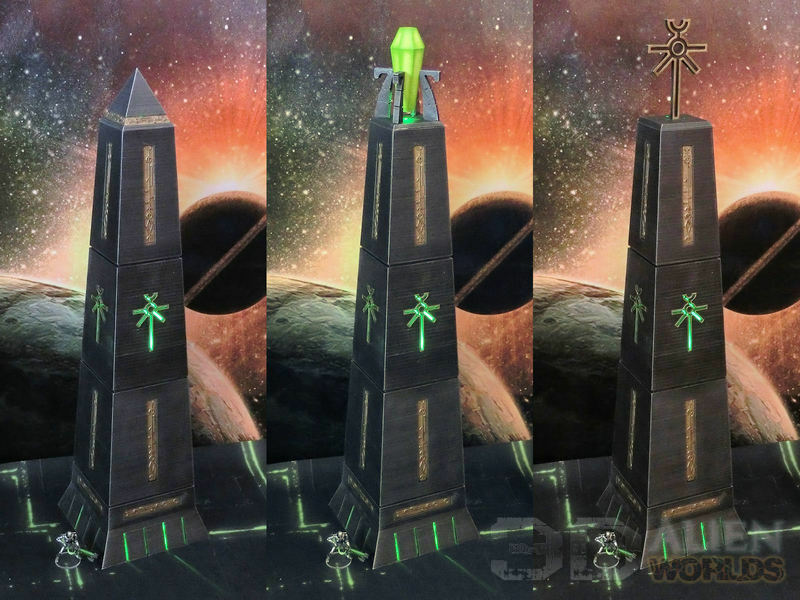 ▲ When space is tight we can limit ourselves to the top 2 levels of the pyramid, which is still just about big enough to hide a Necron monolith behind. 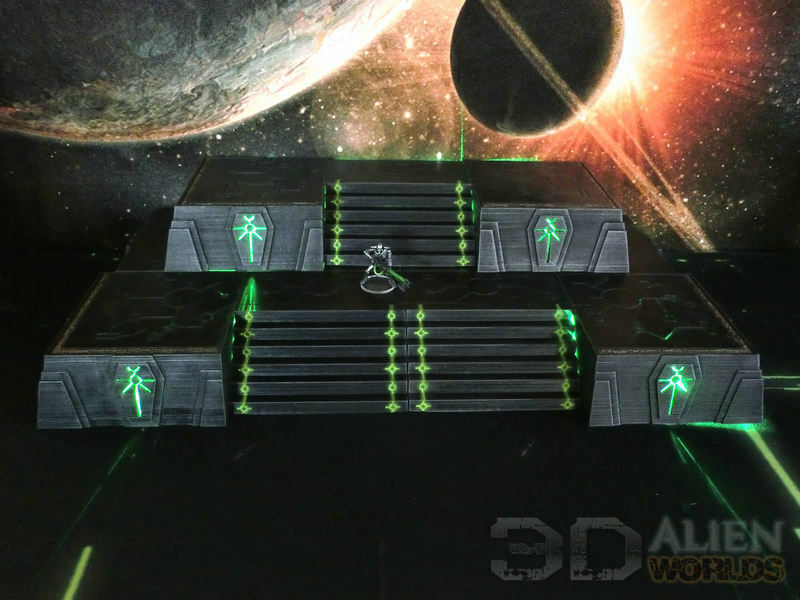 ▲ Atmospheric pic of the stairwell section, with another green LED inside. 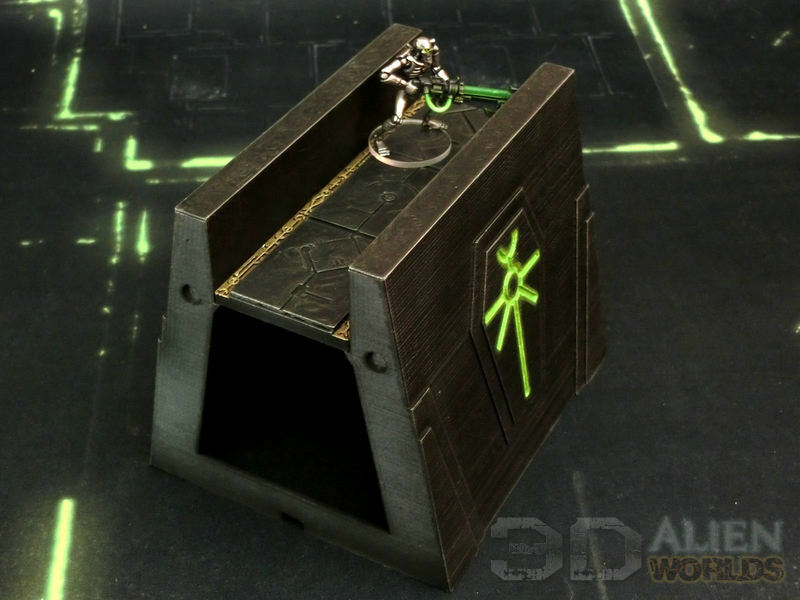 We even have a dicetower section on the back, so you can through your dice in one side and have them come bouncing out the front steps. 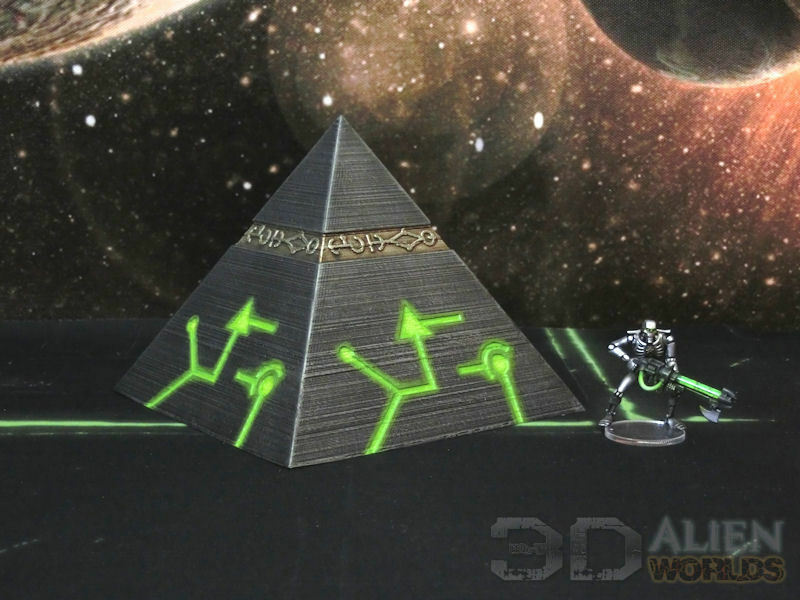 ▲ Finally, here's the pic I used for Thingiverse (3D printing filesharing site), with super bright green paint on the symbols. 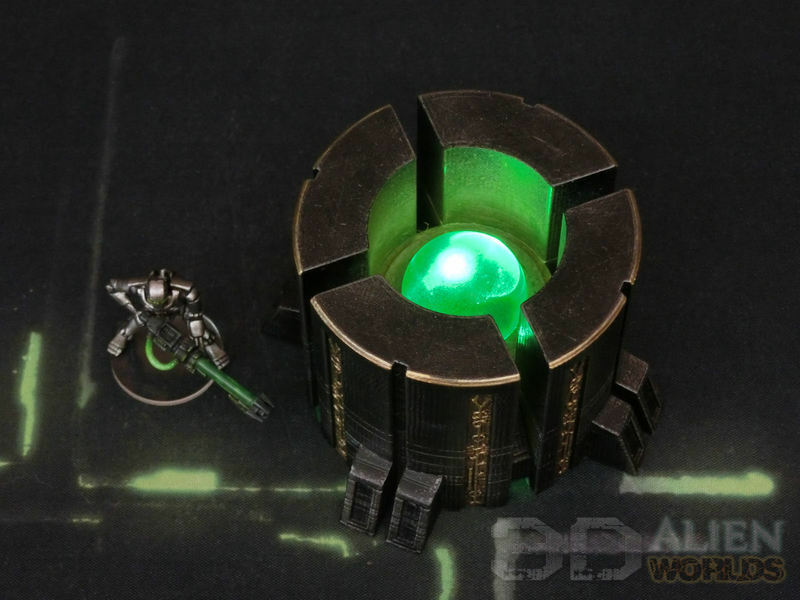 ▲ ...and here's what the smaller generator looks like with a marble in the top and a small LED underneath. Cool, huh? 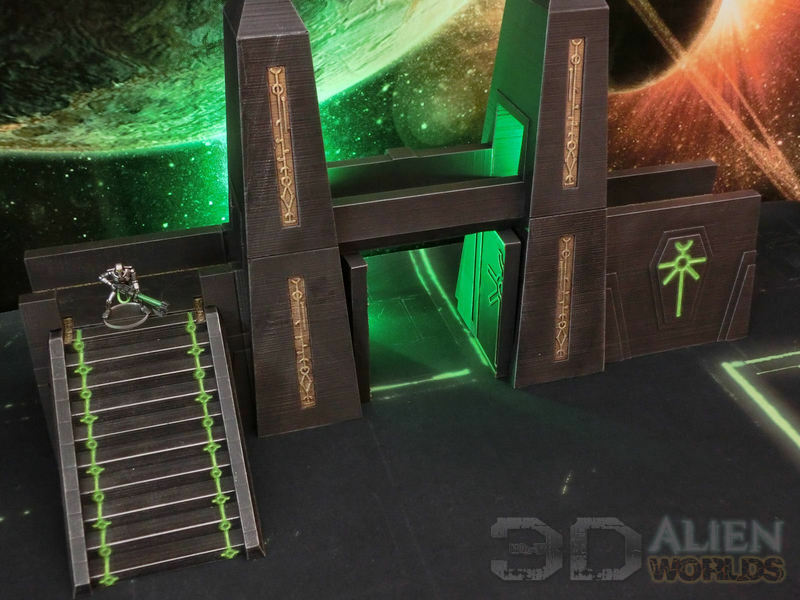 ▲ What Necron tombworld board would be complete without lots of multilevel step hills? 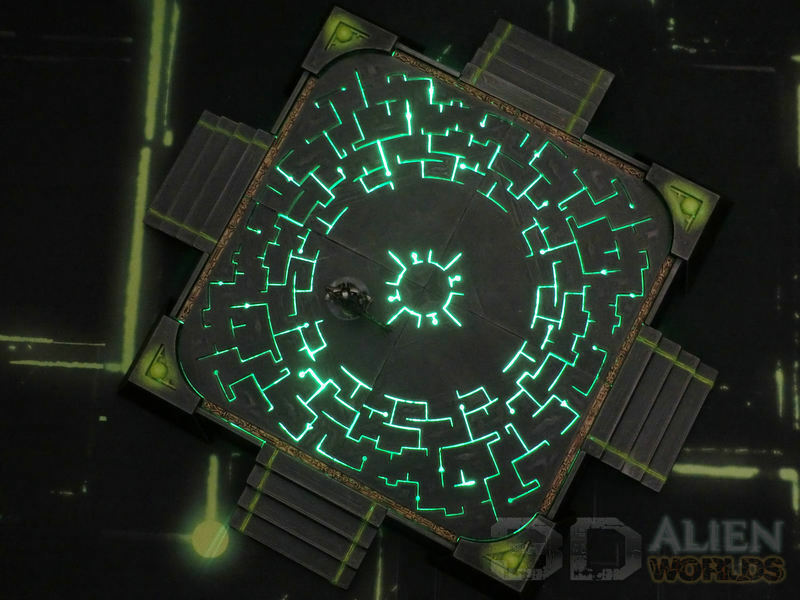 These were designed to quickly cover areas of the board, and can be clipped together in any number of combinations. ▲ This is a 3x3 hill, with straight sections along two sides. 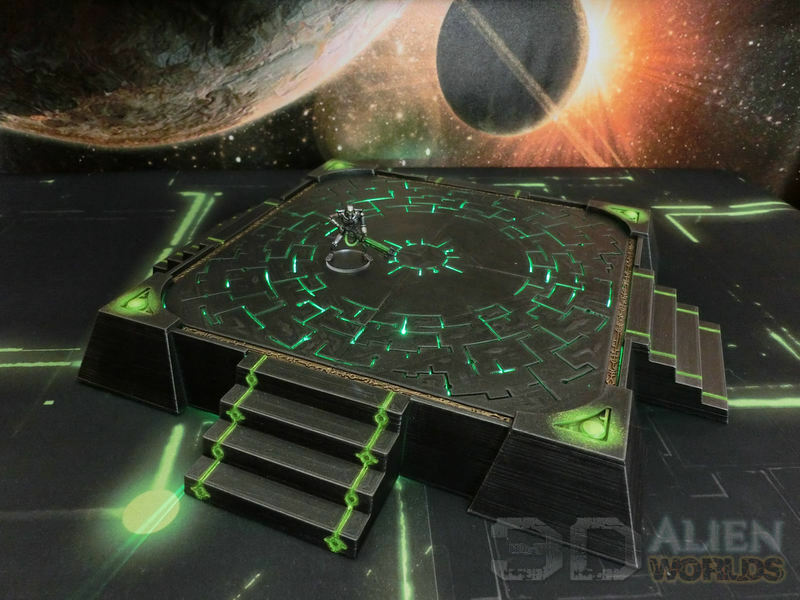 As always, they've got vents in them for LED glows, and the corners also have the Necron symbol in them too. ▲ The same hill, rotated around to show the step sections. These give easy access to the upper levels of hills. ▲ A simple 2x2 hill, made only from corner sections. 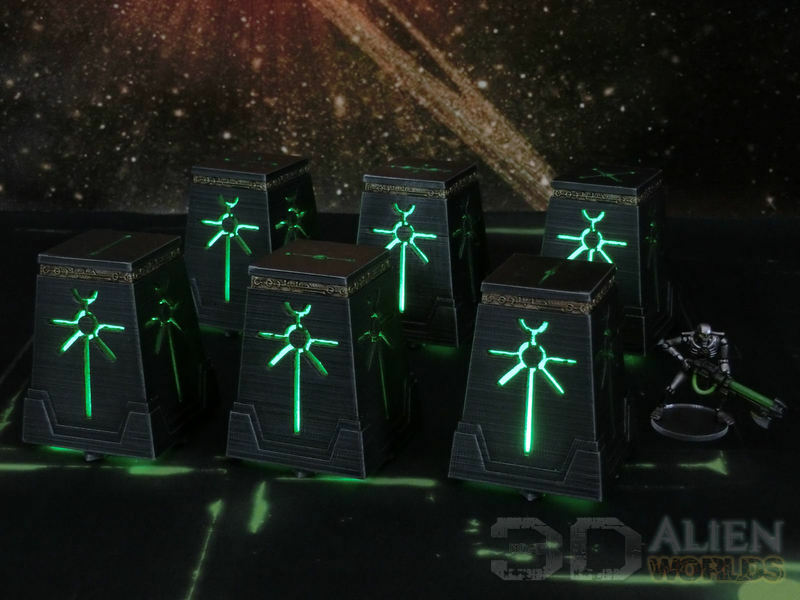 ▲ A larger 3x4 hill, with two central sections both lit from below by LEDs. ▲ An example of a two-level hill. 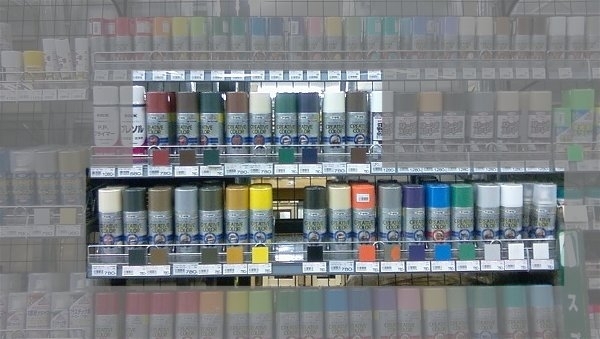 You really can make any shape of hill you like, and they'll all look good! 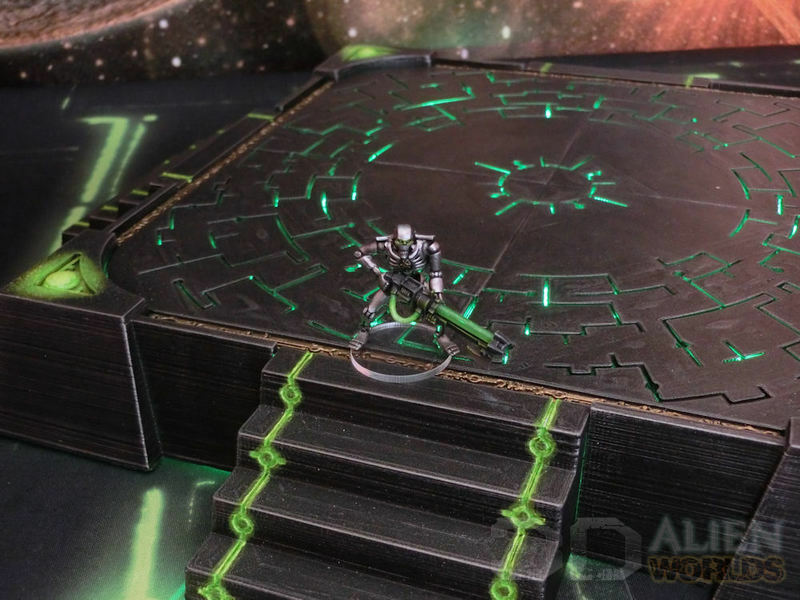 ▲ Straight and junction sections that can be combined with the steps and bridge columns to add some multi-level gaming to your tabletop. Here's a combined shot of the roads with the hill, pyramid and generator prints. Starting to look like a real tombcity now, yes? 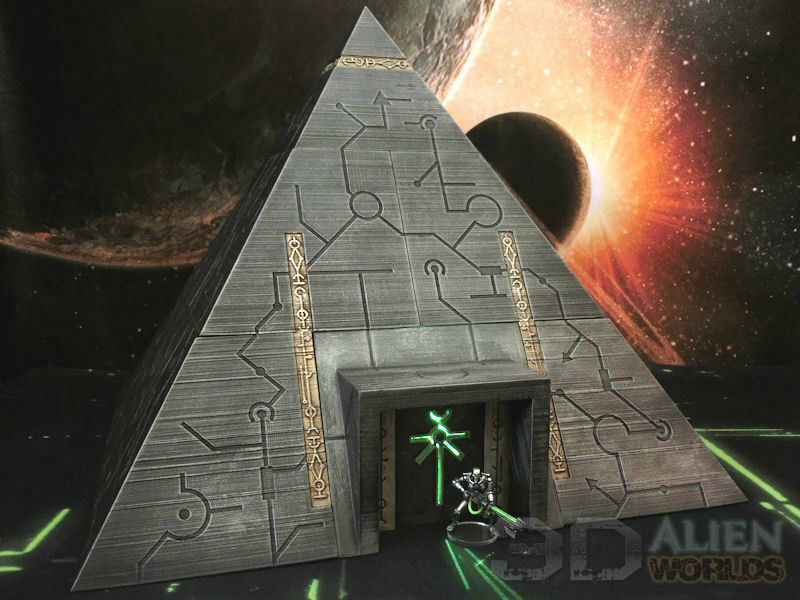 ▲ There's an extra little section of the road designed to fit inside the doorway of the pyramid. I fitted magnets to my road sections, to make it quicker to rearrange them. 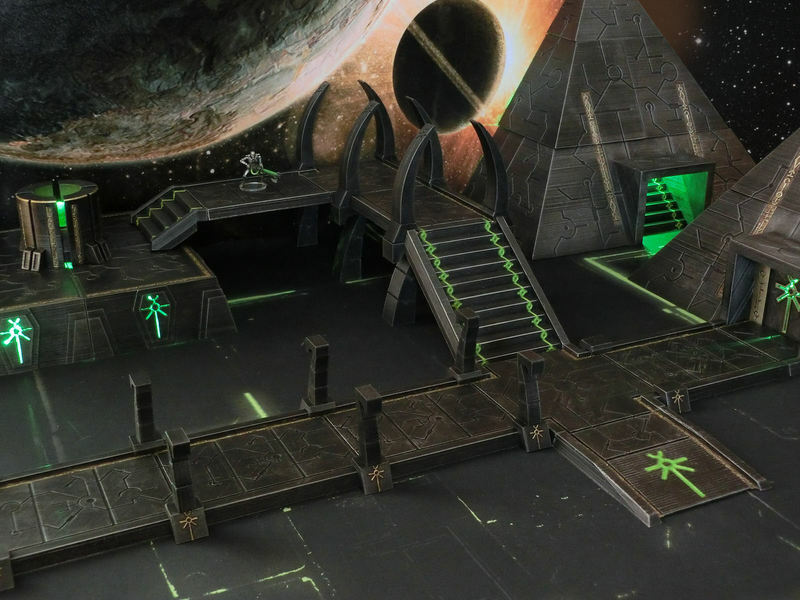 ▲ The curved columns on the bridge can be removed and replaced with other types of column too. 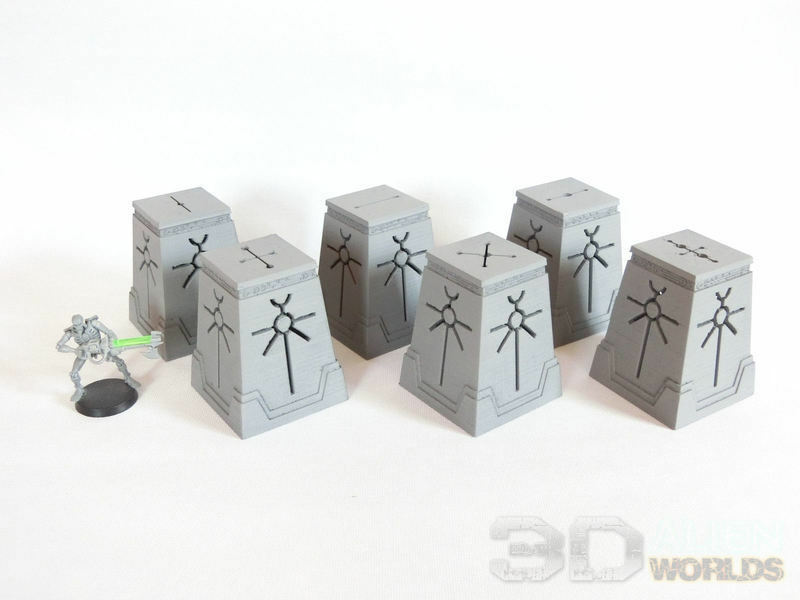 ▲ Quick set of 6 objective markers, which can be lit with LEDs inside. ▲ Each of the objectives has been numbered 1-6 on the top. 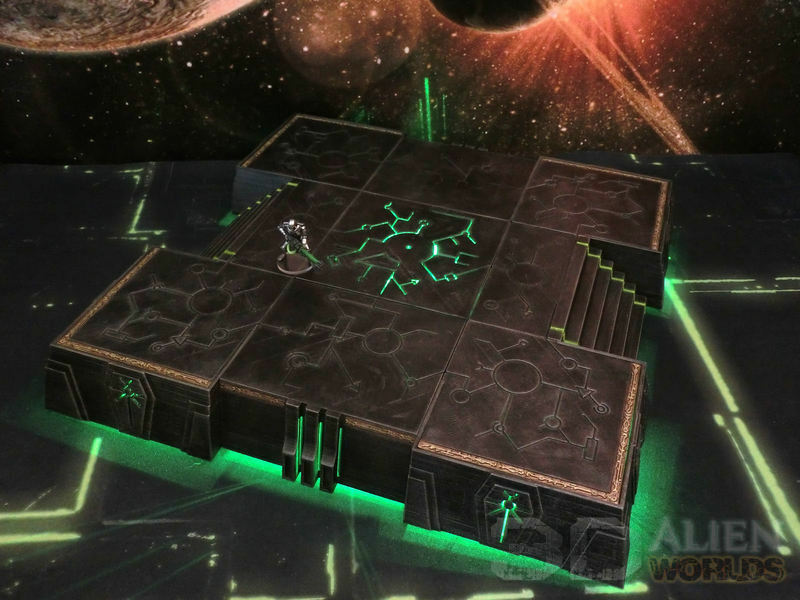 ▲ Probably the last of the big pieces, this set has wall sections and a fairly huge gatetower. 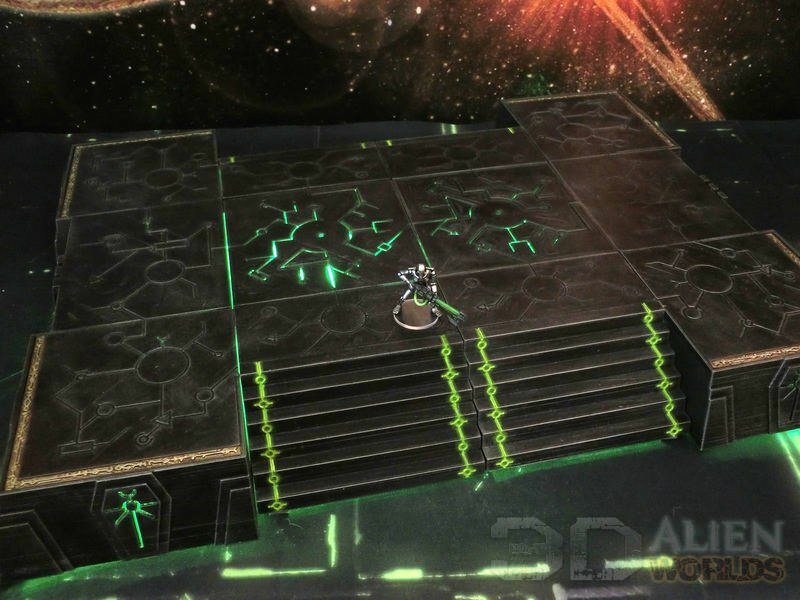 ▲ The back of the walls include an option to join the walls with the steps, so your troops can get up and down as required. 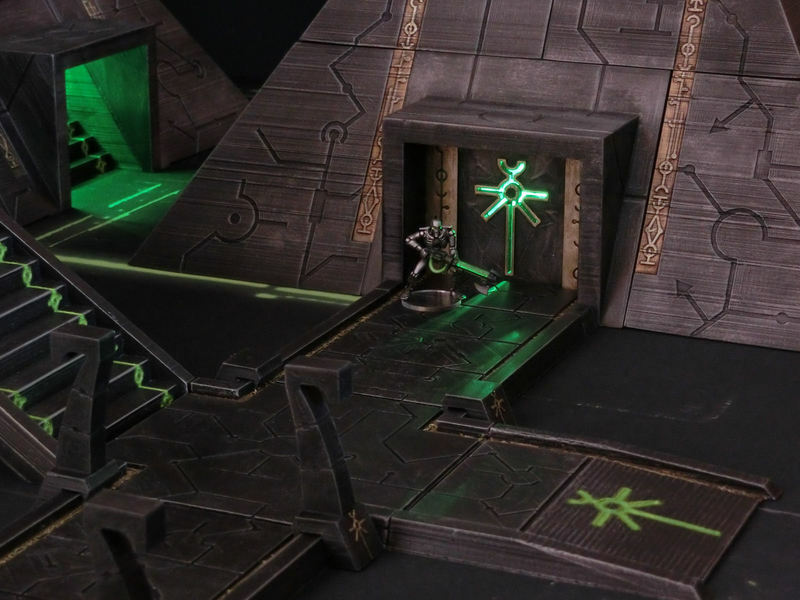 ▲ Pretty simple prints - the walkway simply drops into place between the walls. As always, the sections include clips and magnet holes, so you can take your pick how to connect them. 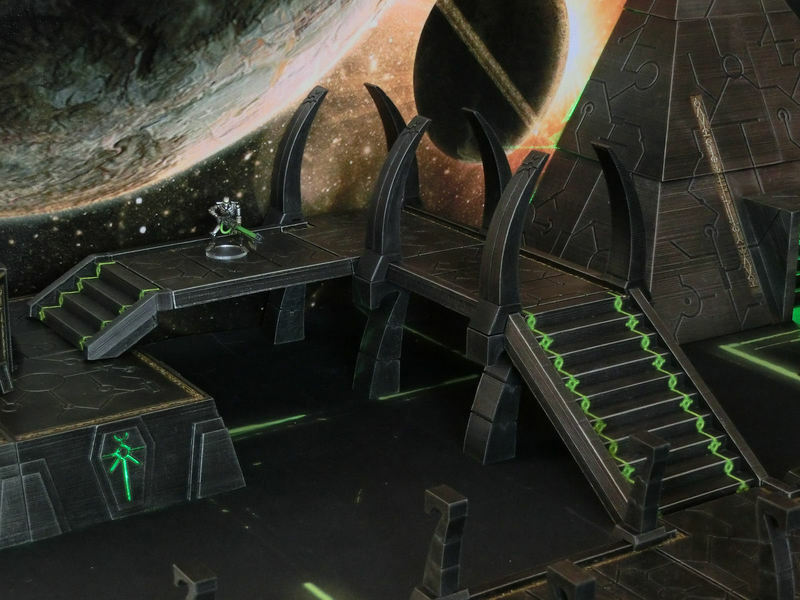 Look how tiny the necron is in comparison!! 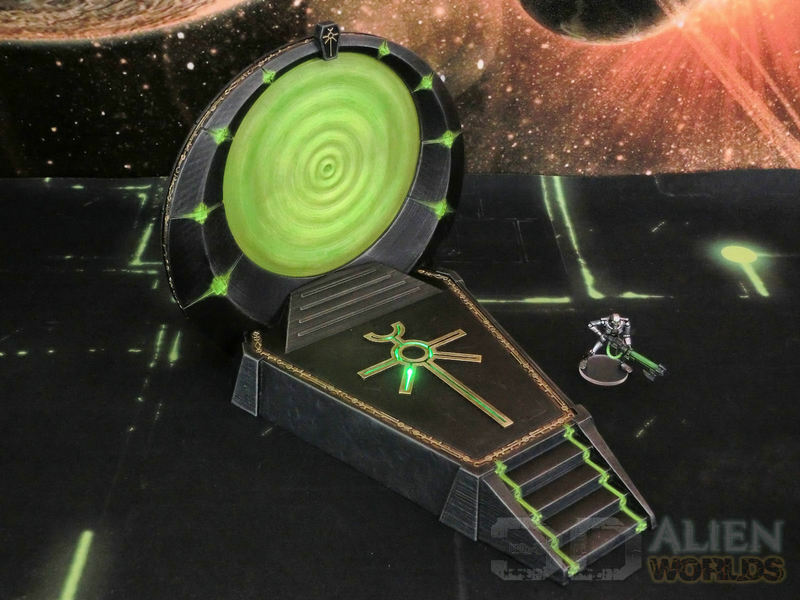 ▲... whereas this one is a ripple design that has been 3D printed and then painted in violently bright green!